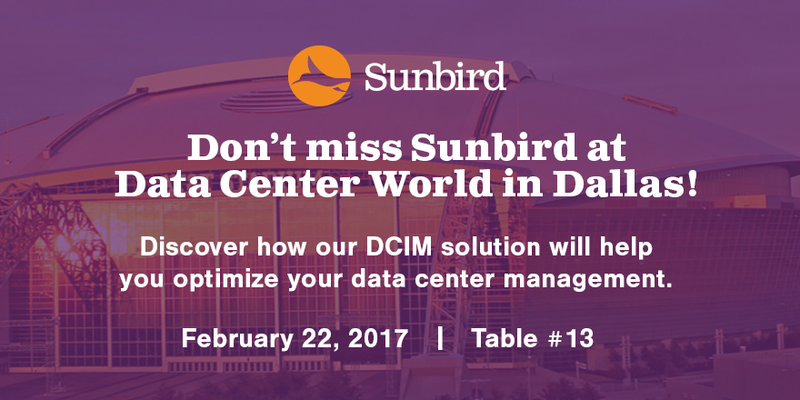 Sunbird is thrilled to be a gold sponsor at Data Center World Local Dallas on Wednesday, February 22, 2017 at AT&T Stadium, Home of the Dallas Cowboys! Stop by Table #13 for a demo of our award-winning Data Center Infrastructure Management (DCIM) solution. New thermal map and time-lapse video to help you identify hotspots. Interactive dashboards built to accelerate data analysis. Door security status and access request audit reports that help you track who has access to different areas of your data center. Enhanced failover reports to accurately predict and identify at-risk cabinets—without impacting equipment in use. At Data Center World Local Dallas, you can connect with over 150 peers in the data center industry. Learn more about Sunbird during our Lightning Talk in the morning before attending the breakout sessions in the afternoon. Don’t miss this opportunity to expand your network, learn from leading DCIM experts, and explore how Sunbird can help you optimize your data center infrastructure. Heading to Data Center World Local Dallas and want to chat one-on-one with a DCIM expert? Our local Sunbird representatives will be available for individual meetings. Let us know if you’d like to meet.